Decorative Life: Months to many years. Should be treated with a growth retardant to make more compact plants both at the time of sale and for months thereafter. Not all growth retardants have equal effectiveness but chlormequat seems to work well. Common relatives include Aphelandra, Crossandra, black-eyed-Susan and shrimp-plant. Leaves are mostly oval, 2-3 inches long, on slender stems. 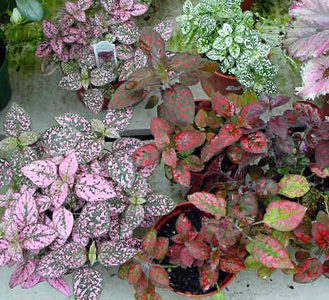 Leaves spotted with pink or white blotches, the reason for one or more of its common names. From the Greek “hypo” (below) and “estia” (a house), referring to the bracts that cover the flowers.